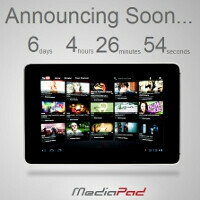 The Huawei MediaPad Android tablet will be announced June 20th, according to the countdown clock on the company's Facebook page. Also according to the picture on the page, it seems to be a 7"+ slate running Honeycomb - for the simple fact that there are no 7-inchers running Honeycomb yet, plus we have the Huawei IDEOS S7 already. The back of the tab is in two tones - light and dark - while the front sports a black bezel. There is a rear camera of unknown resolution and obviously a headphone jack plus a few ports... that's all we can get about the tablet. Huawei is claiming it is "guaranteed to transform your entertainment experience" and, on Twitter, that the Mediapad is "HuaweiDevice's smartest, smallest and lightest tablet ever". The fun part, however, starts with the first commercial for the Huawei MediaPad. We won't be spoiling the joy of watching this one, but just say that it involves a cute girl and a staple in the American diet going rogue. The marketing department evidently has been at the Computex 2011 expo while this video has been designed by the interns left in the office. We'll have to wait on June 20th for more details about the Huawei MediaPad itself, but its first commercial has every chance to become a viral hit. I have to agree. Non-professional grade ad.Couldn't Huawei hire pros to do the job?